In her first Senate Banking Committee hearing, the big question Elizabeth Warren asked when it became obvious that no one who had created the banking mess was ever brought to trial, was how the lawyers could assume one approach was better than another, when they had not performed both to make the comparison that would justify that conclusion. Without any control group, it had been decided letting the banks off would be better than prosecuting them. 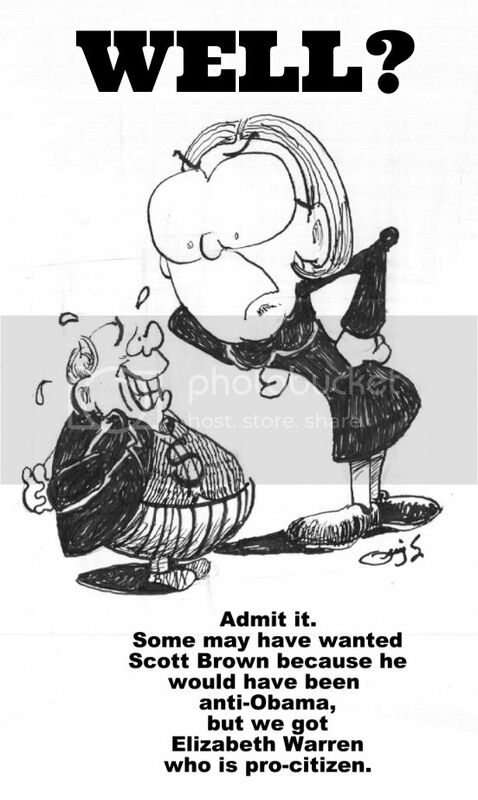 Now at the most recent Senate Banking committee hearing Elizabeth Warren asked Federal Reserve Chairman Ben Bernanke whether Wall Street banks should pay back U.S. taxpayers for the advantage they receive by being deemed “ too big to fail”. It seems, according to a Bloomberg News study, that big banks are essentially subsidized by about $83 billion a year because of investors' anticipating that failing banks would automatically be saved by the government if they get into any trouble. "So I understand that we’re all trying to get to the end of “too big to fail.” But my question, Mr. chairman, is until we do, should those biggest financial institutions be repaying the American taxpayer that $83 billion subsidy that they are getting?…It is working like an insurance policy. Ordinary folks pay for homeowners insurance. Ordinary folks pay for car insurance. And these big financial institutions are getting cheaper borrowing to the tune of $83 billion in a single year simply because people believe that the government would step in and bail them out. And I’m just saying, if they are getting it, why shouldn’t they pay for it?" Without these annual subsidies the "too big to fail" banks wouldn't be profitable. If they didn't get these, as a Bloomberg study found , "the banks occupying the commanding heights of the U.S. financial industry — with almost $9 trillion in assets, more than half the size of the U.S. economy — would just about break even in the absence of corporate welfare. In large part, the profits they report are essentially transfers from taxpayers to their shareholders". And along with the money to shareholders, let's not forget the millions of dollars the executives get as bonuses for running their banks so well and making the high profits off the rest of us. And on that $83 Billion. The amount needed to have avoided the sequestration beginning today is $85 Billion. If the banks were made to pay back what they were given (loaned?) instead of spreading it among the shareholders and giving executives those big bonuses, only $2 billion dollars would need to be cut. But the banks are let off, and the American people have to suffer.